The Everett Hogelin Memorial Award, was originally known as The Outstanding Citizen Award, given by the Fort Lupton Fire Department to honor a citizen of the community for their dedicated work and community involvement. 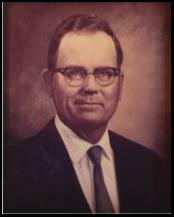 In 1970, Doctor E. R. Pearson was honored for his countless hours that he gave to the department, with the Chamber or Commerce, Rotary Club and City Council. Back at this time, there were no paramedics to run medical calls so people in the district would call the fire department or a doctor, who made house calls. In 1971 the late Everett Hogelin was honored with the award. He too, like Doctor Pearson, gave a lot of his time to the community, serving on the school board, Rotary Club, The Knights of Columbus, and various boards set up by city council. In 1972, the For Lupton Canning Company was honored. This company did a lot for the department in many ways, they allowed employees on the fire department to respond to calls during work hours and allowed them to work on and repair some of the trucks and equipment for the department. Later in 1972, Everett Hogelin passed away in a traffic accident. At his funeral, his family set up a memorial fund, with the money donated, the department changed the name from the Outstanding Citizen Award to the Everett Hogelin Memorial Award. In 1973, Don McPherson, a member and past fire chief, was honored by the department and was presented a plaque by the Hogelin family. Since joining the department in 1978, I have had the honor to present these awards to many outstanding members of the community. The fire department has developed a committee of 2 members to gather nominations from within on an individual, and then the members vote on this person. Only the committee members and the Fire Chief know the results, and the award is presented yearly at the spouse appreciation dinner. The honored party is given a plaque and their name is added to a wall plaque with the past recipients placed at the fire station. Everett Hogelin joined the Fort Lupton Fire Department in 1939, and served in many ways. In 1967 he was honored by the Northern Colorado Firefighters Association at the annual field days with an award for being the most senior fireman in attendance with 28 years of service. He served on the district board until his death in 1973. He always put his family first, his job second and the rest was for the department.